Inviting audiences again into the lore of the spirit board, this Halloween, Universal Pictures’ Ouija: Origin of Evil—from Platinum Dunes and Blumhouse—tells a terrifying new tale as the follow-up to 2014’s sleeper hit that opened at No. 1. 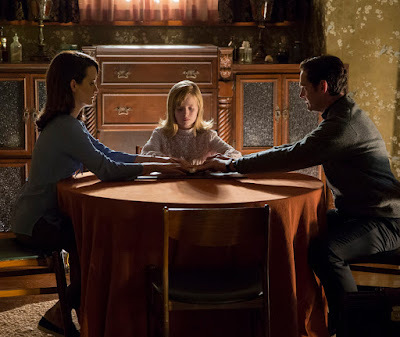 In 1967 Los Angeles, widowed mother Alice Zander (Elizabeth Reaser of the Twilight franchise) adds a new stunt to bolster her séance scam business and unwittingly invites authentic evil into her home. When the merciless spirit overtakes youngest daughter Doris (Lulu Wilson of Deliver Us from Evil), this small family confronts unthinkable fears to save her and send her possessor back to the other side. A year and a half after her husband was killed, financially strapped Alice finds herself raising 15-year-old Paulina (“Lina”) (Annalise Basso of Oculus) and 9-year-old Doris alone. Fortunately for her struggling business, the occult runs in Alice’s blood. Her mother was a fortuneteller and passed down the tricks of the trade, allowing Alice to put on an extravagant sideshow for clients who wish to speak with lost loved ones. The aspiring clairvoyant doesn’t feel she’s a fraud. Instead, she believes she’s peddling closure—the elusive kind she prays to find for herself. With mounting unpaid bills, Alice purchases a Ouija board to spice up her charade and rivet her customers. But once the game is brought into her home, strange things begin to happen: inexplicable noises, daily nightmares and, most disturbing of all, Doris actually starts communicating with the dead, including her father. Initially, the revelations seems like a gift. Alice’s business booms and clients find comfort connecting to those who have passed on, until the true history of the house is unearthed. Decades prior, a deranged surgeon performed grotesque experiments on mental patients under the same roof. Now, to make their screams of anguish heard, one of the tortured has taken possession of Doris. The girls’ school principal’s, Father Tom (Henry Thomas of Gangs of New York), deep concern for Alice’s family leads him to investigate the case. But when the four of them must face a supernatural power (Doug Jones of Pan's Labyrinth) for which even the priesthood could not prepare Tom, they will see that the spirits who’ve opened the portal have no intention of closing it without a deadly fight. Ouija: Origin of Evil is produced by Platinum Dunes partners MICHAEL BAY, BRAD FULLER and ANDREW FORM (The Texas Chainsaw Massacre, The Purge series, Teenage Mutant Ninja Turtles), Blumhouse Productions’ JASON BLUM (The Purge and Insidious series, upcoming Get Out), alongside Hasbro’s BRIAN GOLDNER (Transformers and G.I. Joe series) and STEPHEN DAVIS (Ouija). MIKE FLANAGAN (Oculus, Hush) directs from a screenplay he wrote with his Oculus and Before I Wake collaborator, Jeff Howard.